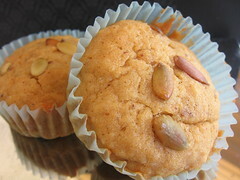 Pumpkin Financiers - Do You Know The Muffin Man? Notes: My freezer had something like 30 egg whites, so I took one of the containers out a while ago to make financiers. This thick batter contains pumpkin puree, browned butter and spices, surefire ingredients that would deliver flavour. After mixing it all together, I let it sit in the fridge until today, about 10 days later. Instead of a 10" round pan, I used 12 medium muffin cups and an 8" round pan. These were not all that great, like a very soft cookie, or a moist, dense cake, but the flavours were muted. I'll continue to make financiers as they consume extra egg whites, but I'm still looking for a recipe that I like.